The Android P update brings in some radical changes for users and developers. At an SRCC event in December 2015, Sundar Pichai, CEO, Google, said, "In the technology world, everything changes at such a fast pace. A lot of what we do is figure out what the next phase is...you have to reinvent yourself." In line with this thought, the technology giant has launched the next Android update - the Android P - after Android Nougat in 2016 and the Android Oreo in 2017. What's intriguing about this new update is that it promises to bring in some big changes - think new gestures for navigation and intelligent features to predict actions and saving battery, etc. This new OS update is believed to have the potential to give a fresh twist to the Android smartphone experience. While there is still time for the full update to hit the market, we tested a few features of Android P on the Nokia 7 Plus. Gesture Navigation: Navigation buttons have made way for swipes in the Android P update. Instead of the home, back and multitasking buttons, a pill-shaped icon at the bottom will be your home button. 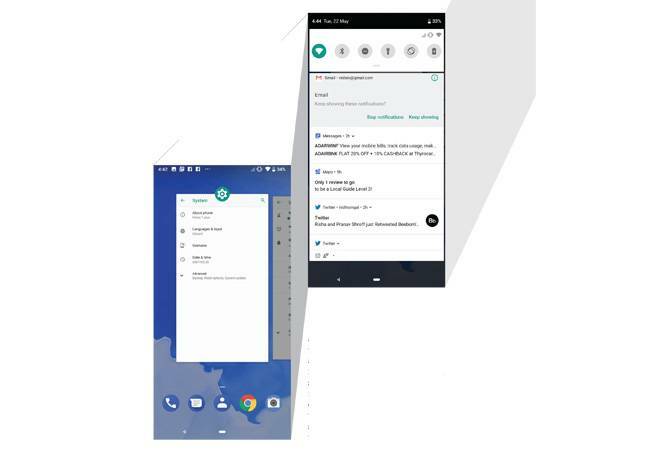 Long press the home icon to launch Google Assistant; swipe up from the bottom to load the app switcher showing running apps; and swipe up twice to launch the app drawer. The back button appears in certain apps/menus when needed. Holding the home button and scrolling it to the sides also shows the running apps. Split screen mode is easy to access - tap on the app icon in the app switcher mode and select split screen. Swiping the app card upward in the switcher mode will close the app. The new gestures and the all-new interface may seem tricky at first, but is convenient to navigate on phones with bigger displays. Smarter Notifications: If you regularly dismiss a particular notification, Android P will present you with the option to turn it off, so it does not pop up again. The update will also bring a smart reply option to respond to emails from the notifications list itself. Digital Well-being: This one dwells on introspection. Google's digital well-being initiative will help users analyse their phone usage and even help in cutting it down if required. The Dashboard option will show the number of hours spent on the phone, on a certain app, the number of times the phone was unlocked and the number of notifications received. Users can also restrict their usage of a particular app using the timer - the app will grey out on the homescreen once the limit is crossed. There is also a 'Shush' feature by which if the phone is placed in a way that the screen touches the table, the do-not-disturb mode will be turned on. The beta version of Android P is available for download on Google Pixel devices and a few other smartphones.